With Thanksgiving behind us, the holidays are officially in full swing in Cincinnati. If you’re looking to get in the holiday spirit, there are dozens of options in the city center. While Downtown Cincinnati keeps the traditional holiday festivities on lock down with the Fountain Square ice rink and Holiday Junction at the Cincinnati Museum Center, Over-the-Rhine has embraced a more eclectic mix of urban craft markets, revisited German traditions, historic tours, and local shopping. If you’re looking for more than wassailing and Breakfast with Santa this season, check out UrbanCincy’s round up of things to see and do in Cincinnati’s city center. Beginning this weekend, the Over-the-Rhine Chamber of Commerce kicks off the holiday shopping season on Black Friday with its sixth annual “Holidays in the Bag” special. Purchase a bag and receive discounts from over 25 participating businesses in OTR. Bags cost $5 and this year’s proceeds from bag sales benefit Future Leaders OTR. Score deals from new OTR businesses like Homage, Brezel, Macaron Bar, and Cincy Shirts, and more. Check out the full list of discounts here. In addition to Black Friday specials, OTR will also continue its regular Final Friday gallery hop with a variety of events and shop specials. November’s Final Friday art walk will include Walk This Way, a pop-up art gallery inside OTR’s alleys. Located between Clay Street and 13th Street, the event transforms Drum Alley and Coral Alley into an artist market featuring over 13 local artists, a majority of whom are students from Art Academy of Cincinnati. Walk This Way is a collaboration between Spring in Our Steps, the Art Academy and Urban Sites. Afterward head back to 13th street for another pop-up shop at Exposure/13, the Art Academy of Cincinnati’s student-run gallery. Other Thanksgiving weekend highlights in OTR include the kickoff of the OTR-a-Glow window display competition, Small Business Saturday, and Main Street Stroll and Shop and Caroling. Several indie pop-up markets in the city center will highlight fine art and handmade goods by regional artists. Visit the fifth annual Crafty Supermarket at Music Hall November 29 to browse 90 crafters, artists, and makers from the eastern U.S. On Sunday, November 30, City Flea Small Mall brings together local brick and mortar businesses like Parlour, Leftcoast Modern, indigenous, Fern Studio, Casablanca Vintage, Rock Paper Scissors, and more. This year the second annual event will expand into Contemporary Arts Center in addition to its original location at 21c Museum Hotel. Looking for more opportunities to shop local? Findlay Market will host “Christmas at the Market” December 6, 7, 13 and 14 where visitors can find gifts, holiday entertainment, warm drinks and the Caracole Christmas tree sale. Other craft markets include Art Academy of Cincinnati’s Snowflake Sale on December 6, featuring fine art, crafts, “poetry while you wait,” on-site screen printing and a clothing swap, Art on Vine’s holiday market at Rhingeist on December 14 and City Flea’s special nighttime Unwrapped Market at Washington Park on December 15. Washington Park will host several holiday events this season. In addition to regular weekend programming like caroling at the bandstand and visits to Santa’s Workshop on Saturday afternoons, Washington Park hosts its fourth annual Light Up OTR party. On December 12 the community is invited to assemble and distribute over 1,000 luminaries. Afterward Washington Park will light its Christmas Tree. The holidays are also an excellent opportunity to catch special holiday arts events and concerts. For those looking to tap into their German roots, American Legacy Tour hosts Christmas Saengerfest December 5 and 6. More than a dozen regional choirs will perform at venues including Memorial Hall, Christian Moerlein Brewery, and St. Francis Seraph. Meanwhile, The Cincinnati Symphony Orchestra and the Cincinnati Pops have a full concert schedule through December 21 and theater nerds can delight in Know Theatre’s Bureau of Missing Persons and Ensemble Theater’s Sleeping Beauty. If urban exploration is more your thing, consider the Main Street OTR Walking Tours. These new guided walking tours will explore the architecture and history of Over-the-Rhine’s Main Street. Tours will be available December 6 and December 11. For a more traditional trip downtown, free horse drawn carriage rides are available on weekends through December 14. 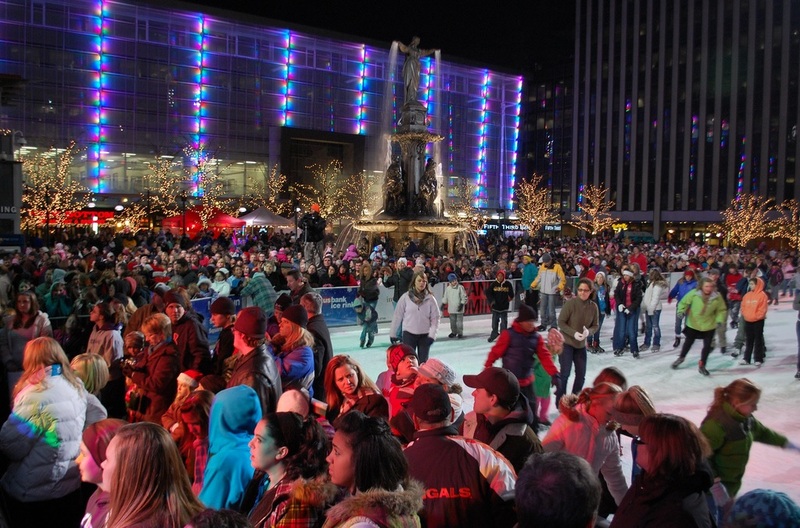 More downtown holiday activities can be found at downtowncincinnati.com. What are your new favorite holiday traditions in Cincinnati? Share your favorite off-the-beaten path traditions with us in the comment section.